The new three chip solution makes it possible for handset makers to use a single antenna for both NFC and wireless charging, the chip maker says, increasing the charging area while reducing the overall footprint and improving safety. COMBO: Antenna can be shared by NFC and wireless charging components. Click to enlarge. Renesas has unveiled a combination NFC and wireless charging solution for mobile phone manufacturers that, the chip maker says, will provide mobile phones with a wider charging area while also taking up less space. 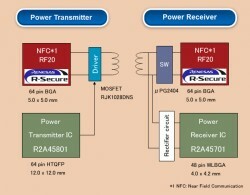 The solution also offers the potential to use the NFC capability to verify whether a device can be safely charged wirelessly before the supply of power begins, says Renesas. “Wireless charging is starting to become popular in products such as smartphones,” says Renesas. “It eases battery charging of portable devices and makes cables and connectors redundant. However, Renesas’ NFC wireless charging technology, the company explains, “widens the charging area to about 10cm. It incorporates the technology of the existing NFC MCU, and utilises the NFC antenna to implement a wireless charging system that uses a single RX antenna for NFC communication and receiving power, thereby improving reliability while reducing the bill of material of a receiver design. The new NFC wireless charging combo comes in three parts, which are available together as a single solution. 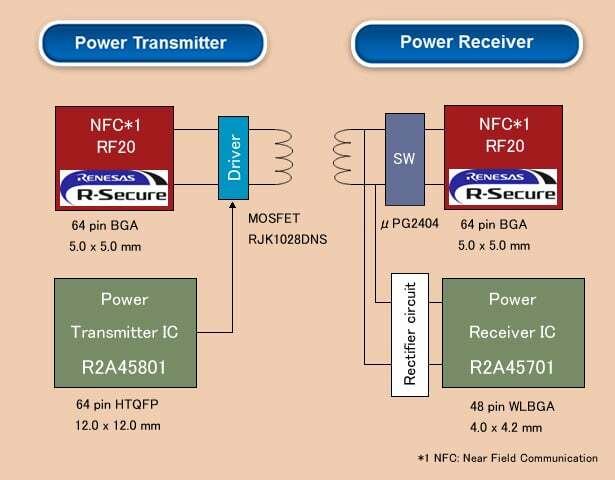 Renesas will begin shipping samples of the RF20 NFC controller, IC R2A45801 power transmitter and IC R2A45701 receiver in November 2012 and plans to ramp up to produce one million units a month during 2013. Each of the three components will cost US$6.00 per unit and the chip maker says it has also submitted the new solution to the NFC Forum’s Wireless Charging Task Force.